You've Hired a Realtor - What's Next? How much is my home worth? How much should I ask? What can I do to make my house more attractive to Buyers? Will spending money on improvements increase the value? If so, how much should I spend? Should I list my home with a Realtor? If so, how do I choose the right one? How much does a Realtor charge in commission? Where am I going to live next? Am I going to rent or buy again? The questions go on and on and on. It’s not difficult to see that you could get lost in all the questions, or at least be so distracted or pre-occupied that you forget to ask the basic one: HOW DO I REDUCE THE STRESS OF SELLING? One way to reduce the stress of selling is to keep your eye on the big picture and not get bogged down with the fine points. If you understand and get a feel for the process in general terms then you will be able to make sense of the details which should lower the level of anxiety. The process begins with the obvious: the decision to sell. Make sure it’s what you want to do or need to do. Talk it over with family, friends, legal advisors, financial advisors – in short your support system. When you are comfortable move on to the next step. What is the balance of my mortgage? What kind of mortgage do I have - a closed or open mortgage? Will there be a penalty for selling before my mortgage is due? How much time remains if any in the mortgage’s term? A closed mortgage is a mortgage which does not allow for repayment of the entire mortgage balance during the term unless the Seller pays a penalty, whereas an open mortgage can be repaid in full at any time during the term without any penalty being charged by the lender. Although penalties on closed mortgages vary, the standard is that the minimum penalty for early payout is three months interest. Keep in mind that the penalty can be considerably higher depending on how mortgage rates have changed over time, (i.e. what rates were at the time that you took out your mortgage, what the current rate on your mortgage is, what term is remaining on your mortgage, and what the mortgage rates are in the market when you pay it out). The potential to have to pay a penalty makes it essential that you talk to your lender first. Without knowing what the balance of your mortgage is, plus whatever penalty may be added, you cannot figure out what your net return will be from the sale of your home. Once you know the payout amount then you can start calculating how much money you will have when the sale closes before an offer is presented. Never forget a gross sale price means nothing. It’s the net sale price which is important. Finally - always remember that when you accept an offer, it becomes your legal duty as the Seller to clear the title of all financial charges, and if there is not enough money from the sale to do so, then you may become liable to the Buyer. Now it’s time to determine the value of your home, or more correctly, the current market value. Market value is not the asking price, but rather the selling price. In order to get some idea what your home is worth, you have to become acquainted with the real estate market. First, check the papers in your area, as well as the internet for houses that are similar to yours which are going to have open house and go see them. When looking at houses and determining similarity, always keep in mind that the value of a home is a function of location (busy road, water view, close to schools and parks, etc. ), condition, (well maintained verses fixer upper) and amenities (number of bedrooms, number of bathrooms, presence of a suite, etc.). Also look for similar houses that have recently sold and the prices that they sold for. At the end of this venture in self-education, you should at least have some idea of the range of values for both an asking price and a selling price. If you do not have the time or inclination to investigate the market, or wish to confirm your valuation you can for a fee hire a real estate appraiser to assess the value of your home. Alternatively, you can ask a Realtor or Realtors to place a value on your home. Realtors will be happy to do this for you without charge. However, the expectation is that if you decide to market your home with the aid of a professional that you will consider employing them. If you do not know a great Realtor, let us know, and we will send you a list of our Trusted Real Estate Professionals. Looking at the graph, the vertical line represents the sale price and the horizontal line shows the time. In essence, this graph allows us to plot changes in sale prices over time. Let us say that the current asking price for a particular home is $500,000, indicated by the red horizontal line. Let us further say that the actual market value or sale price for the home is $400,000. The blue line that indicates sale price is horizontal because in a flat market the sale price does not change over time. Notice that the lines (asking price and sale price) never meet. That tells us that in a flat market, all things being equal, your pricing has to be right on or very close to the market value or sale price, if not, the home will not sell regardless of the amount of exposure or time allotted to its marketing. Therefore, the pricing strategy here is to get your price right from the start, otherwise plan to waste a lot of time until you make the required reduction in the asking price. At this point, it might be a good time to dispose of a myth which seems to greatly affect peoples' judgement with respect to pricing - the myth of the out of town or special buyer. The basis of this myth is that there is a large number of people, generally thought to be from out of an area, that are so ill informed, dull witted and have so much money to burn that they will gladly pay more than the market value for the property. People do make mistakes and overpay on occassion, however this is the exception, and to base the plan for the sale of the most valuable asset you possess on an exception may not be a wise decision. The end result of relying on this myth is that the Sellers hold on to their unrealistic price for far too long with the inevitable outcome that they become dissappointed their property has not sold. Trying to sell in this kind of market should only be undertaken as a last alternative. The typical case is where circumstances, usually financial, are overwhelming the owners, forcing them to put their home on the market. In a falling market, getting the pricing strategy right becomes even more important. Remember, the primary objective here is to conserve your equity. Lets look at the graph for a falling market. The market value or sale price here is the same as in the previous example, $400,000. The blue line signifying the market value slops downward indicating that overtime prices are falling. 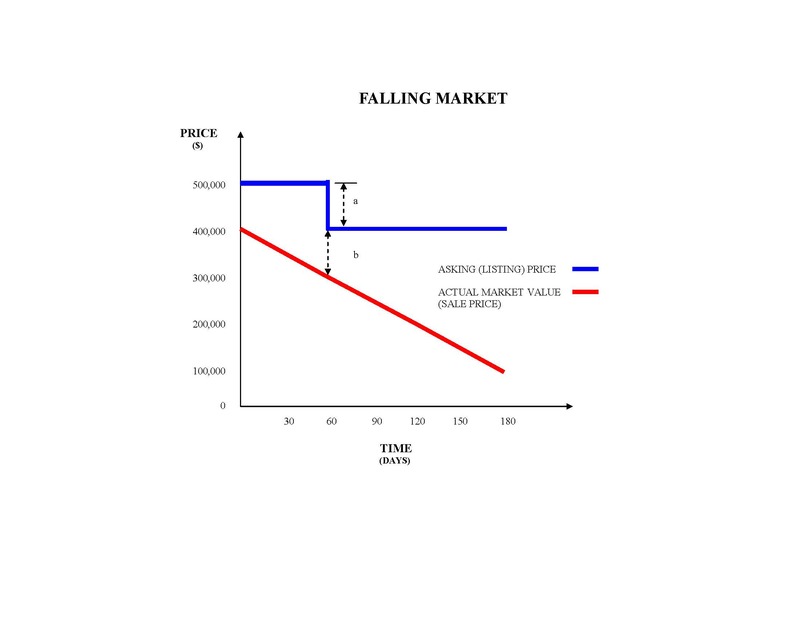 In our example, the fall in the market is estimated to be $50,000 every thirty days. Also, as before, the asking price is $500,000 indicated by the red line. Right from the start, the home is overpriced by $100,000 as indicated by the vertical distance "a" on the graph. Now, it is 60 days after the home has been on the market and there have been no offers. In other words a price reduction is in order. So, the owner reduces the price to the market value it was when the home was originally put up for sale - $400,000 - as indicated by the red line at "a". However, by this time the market value of the home has dropped from $400,000 to $300,000. 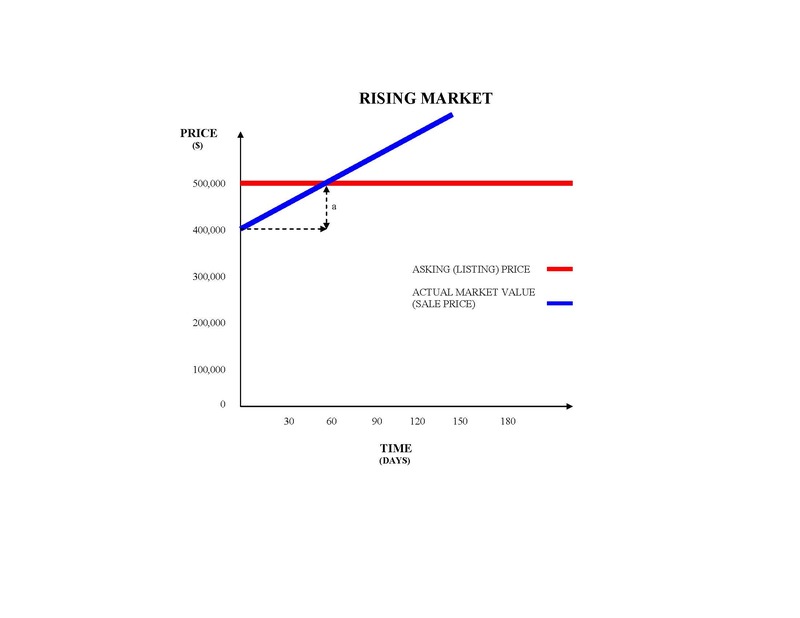 So, the asking price still exceeds the market price by $100,000 as indicated by the vertical distance "b" on the graph. Therefore, by not pricing the home correctly from the start not only has the owner wasted time, he has lost $100,000 in value (original market value $400,000 less market value 60 days later $300,000 = loss in value of $100,000). If this pattern is repeated, the owner's loss of value continues to grow and the graph of the asking price looks alot like a set of stairs. This is what is known as chasing the market downwards. The lesson here is that in a falling market always price your home aggressively at exactly the market value or below. Even if you have to take a loss it's much better to take the loss as quickly as possible because the loss will only grow with time. From an Owner's point of view there is nothing better than a rising market. Here, the longer you wait the better off you are. As long as you are patient and you don't outwait the market, (you sell before the market conditions change from positive to negative) an owner's initial asking price can exceed the market value without any harmful effect to the selling price or value. As before, the market value is $400,000. However, the blue line signifying the market value here slopes upward indicating that over time prices are rising, and the rise in prices is estimated to be $50,000 every thirty days. The asking price is $500,000 indicated by the red line. Right from the start the home is overpriced by $100,000 as indicated by the verticle distance "a" on the graph. Now it is 60 days after the home has been on the market, and there have been no offers. 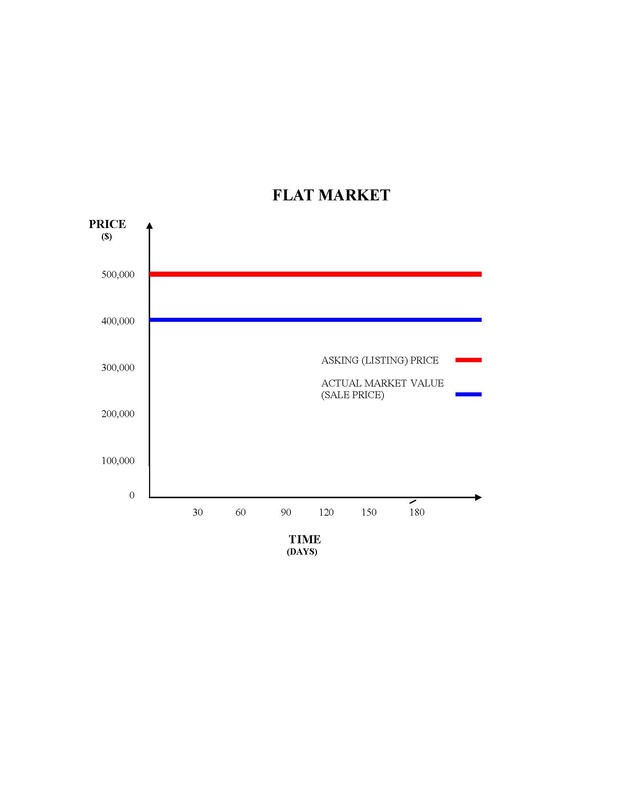 The difference from previous examples is that the market value line has risen to the asking price line, indicating that the asking price is now equal to the market value with the result that a sale should occur. In other words, by over pricing the home from the start and being prepared to wait, the Owner has been able to get the price they wanted. The lesson - the only time an owner can afford to price his home for more than its market value is when the market is rising and they have the luxury of time. Now that you the Owner have talked to the mortgage lender, reviewed market information on prices and determined the state of market (flat, falling, rising) it’s time to decide have you are going to market your home. Essentially there are two choices: you market your home on your own, or you hire a Realtor do it for you. We at Farley Martin Notaries generally recommend to Sellers that they retain the services of a Realtor. Realtors are trained professionals: in writing legally enforceable contracts, in marketing properties, have access to the Multiple Listing Service (MLS), which is the most powerful of all real estate marketing tools, and are insured with respect to both the advice they give and the actions they take or fail to take. Just like when you are buying, never forget that with any job or task the advantage of having the assistance of someone with know how is that it take less effort, the process is more efficient and the outcome or result is much better – ie. you have a much better chance of getting the price you want. Further, always remember that your Realtor is only paid only when you are satisfied, that is when you sell your home. If you do not know a Realtor or are unsure how to find one to work with just ask us we will be happy to match you with one of our trusted real estate professionals. If you decide to sell your home alone without guidance of a Realtor, we can certainly assist you. Now it’s time to choose a Realtor and list your home for sale. Where to start? Some ideas to find a Realtor might be: a Realtor who is a personal friend, a Realtor referred to you from a family member or friend, the Realtor who sold you your home, or you can choose a Realtor from our list of preferred Real Estate Professionals. Regardless of how you start the selection process it is important that you interview your prospective Realtor. This interview should not only be a discussion of market value and asking price, but should also include current market conditions, marketing and pricing strategies, marking methods (advertising, open houses etc. ), suggestions for improving saleability, times for viewing by potential Buyers, features of the home which are the most appealing to potential Buyers, features of the home which are problems for potential Buyers (a buried oil tank, asbestos insulated hot water pipes, etc.) and listing costs. Because it inevitably causes problems down the road make sure that the discussion of pricing includes a detailed conversation of price adjustments and specifically, when they may be in order and how much may be involved. Often in the process of competing for, or in the euphoria of acquiring a listing, neither the Seller nor the Realtor like to talk about price reductions. No one wants to introduce any negativity into a positive process. However, this attitude does neither party any good. All it does is to kick the can further down the road, create misunderstandings and cause arguments. So have the discussion, reach an understanding, and move forward. If no understanding is reached, agree to disagree, and either rethink selling your home or look for another Realtor. Often Owners find it beneficial to interview several Realtors prior to selecting one. The advantage is that you receive more information and opinions which, all things being equal, should result in a more informed decision on your behalf and in the end the selection of the best Realtor for the job. If you do use this last method of selection, don’t be afraid of offending anyone. Realtors, in most cases, expect to have to compete for your business. Just inform them from the beginning that you are interviewing several prospects for the privilege of selling your home. You've Hired a Realtor - Whats next? So you have made your decision and your Realtor places the for sale sign on your property. Now you wait for your Realtor to perform – find a Buyer who will make an acceptable offer. While you are waiting you should be actively keeping an eye on the marketing of your home. The when and the how of this should have been discussed in detail when you interviewed your Realtor. For example, how often is your Realtor suppose to give you updates on showings of your home? What is the response from print and web advertisements? Did they provide you a copy of the MLS listing, and a property fact sheet for your review, etc? The day has come, your Realtor phones and tells you “I’ve got an offer and I would like to set a time to come over to the house to show it to you”. There’s no better feeling for a Seller in the world. Your Realtor arrives, and in the event that the offer was written by another Realtor, sometimes not alone. The process of reviewing the offer always starts with the price. Next, you look at the size of the deposit, when it is to be paid and to whom, the conditions included in the offer, the dates for completion and possession...are they reasonable, and do they fit your schedule? Subject to conditions are clauses in your offer which describe events or things that have to be happen or have to be done before the Buyer is legally committed to buy your home. Some of the more common subject to conditions are: subject to financing, subject to a building inspection, subject to the Buyer’s Notary’s approval of the contract, subject to a review of the property’s legal title and subject to confirmation of the property’s ability to be insured. Thus, it is important for you to make sure that with all subject to clauses, you get a detailed explanation from your Realtor of what they mean, and how they affect you.